1. Premiere of “John Adams”: With producer Tom Hanks horsing around with a flashlight when the power went out. 2. First midnight screening of the “Dark Side of Oz”: Judy Garland meets Pink Floyd. 3. Debut of “The Sailor Bob Story”: 850 people cheering a rock star — Sailor Bob. 4. 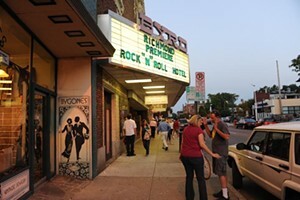 Style Weekly’s “Rock ’N’ Roll Hotel” screening: People turned out in record number to watch a local movie so bad it was good — all to show support for the Byrd. 5. Director Mel Stuart speaking after a screening of “Willy Wonka and the Chocolate Factory”: Where we learned that the screenwriter wrote the final scene via trans-Atlantic phone call while cast and crew waited on set.